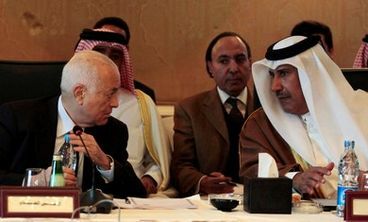 Elaraby seeks support of UNSC for plan to ask Assad to step down; Arab foreign ministers discuss "developments." Thanks for this - Assad must stand down - and stop murdering the Syrian people! The world has already demanded he step down to no avail. So what is the UN going to be able to do? I don't even see what the point of the observation was as they were not allowed to move around freely. Diplomacy is one thing, we are now in the arena of stupidity.The Arab League Chief has gone to the UN to ask for support in taking Assad down. How many people have to continually die before these people don't look any more ridiculous than they are? The real power and authority against Assad and his continued campaign of brutality is with the Arab League. They now want to toss the ball back to the UN, they need to get their act together and squash Assad like the bug he is, enough discussions, enough death - those in that gang of self appointed demigods need to put up or sling away in shame.